Buffalo Computer Graphics, Inc. (BCG) is pleased to offer PCRadar Tutor. 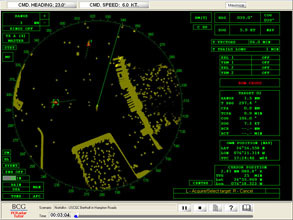 This maritime training product enables a student to learn the basic functions of radar operation and ship navigation principles through a self-paced Windows PC application. PCRadar Tutor facilitates self-paced learning by exposing the student to challenging situations and built-in testing capabilities, without the direct attention of an instructor. All training scenarios are created by an instructor and made available to the student at run time. 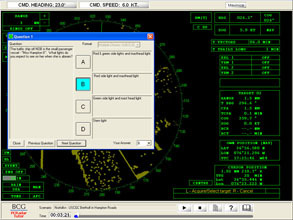 To support the learning experience, PCRadar Tutor provides the student with an emulated ARPA radar display. 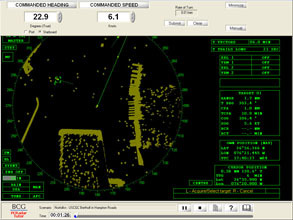 This shows land, targets and environmental effects; while allowing the student to maneuver their vessel with integrated virtual steering controls. 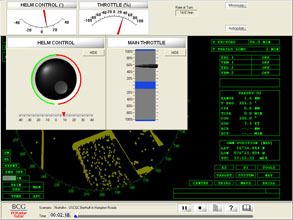 The student is also provided with a Scenario Control Panel with Game Clock, Play/Pause/Stop controls, access to instructor generated Briefing Text and Question Sets, as well as a Reference Library feature. To support PCRadar Tutor, BCG offers Scenario Builder, a package that allows an instructor to create training scenarios. Scenario Builder offers tools to select a geographical area of operation, define Ownship and traffic ship parameters, create briefing text and question sets which then all play together to challenge the student. Scenario Builder allows the instructor to review a completed PCRadar Tutor scenario. The scenario records all student Ownship maneuvers and question set responses.